Old hand drawn Bollywood poster of the classic blockbuster Hindi film, Humse Hai Muqabala (1994) for sale. This is an actual surviving classic hand drawn movie poster of the 1994 Hindi film that starred India’s best dancer Prabhu Deva in the lead role opposite south superstar Nagma. The film featured an award winning soundtrack composed by A. R. Rahman. Songs from the film, most notably “Urvashi Urvashi” and “Muqabala Muqabala” featuring iconic Prabhu Deva dance sequences went on to become a rage throughout the nation and are played till today. Humse Hai Muqabala was the Hindi dubbed version of the original Tamil release, Kadhalan. The film was also dubbed in Telugu as Premikudu. Humse Hai Muqabala was a massive success at the box office, winning four National Film Awards, making this hand drawn Bollywood poster highly collectible! Printed and circulated somewhere in the 1990s, this hand drawn movie poster was printed for publicity of the film but never ended up being used. This hand drawn Bollywood poster was originally created on canvas by a small time art studio in Kolkata, giving it a very quirky appearance. The lead couple Nagma and Prabhu Deva are seen in quirky hand drawn avatars in this classic hand drawn movie poster. Old Bollywood still photos of the blockbuster Hindi film, Humse Hai Muqabala (1994) for sale. This is an actual surviving set of pictures designed and printed for the publicity of the 1994 film that starred India’s best dancer Prabhu Deva in the lead role opposite south superstar Nagma. The film featured an award winning soundtrack composed by A. R. Rahman. 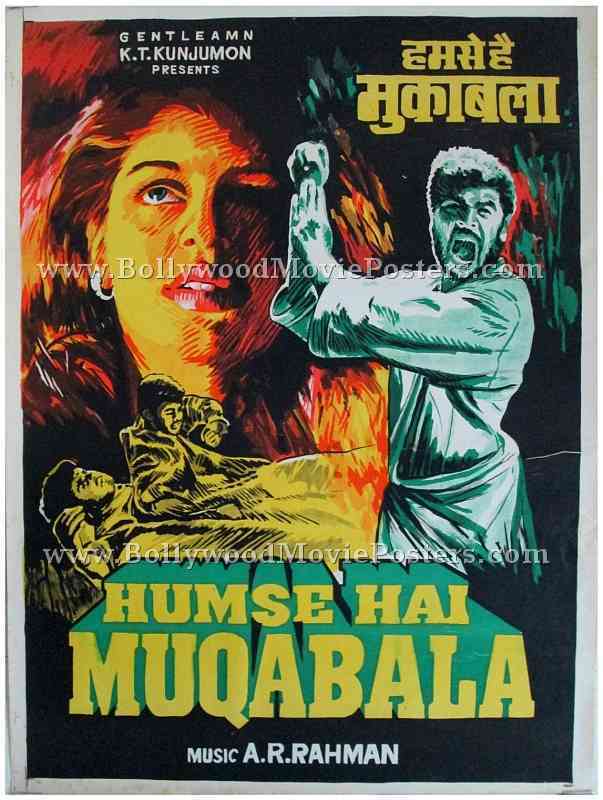 Humse Hai Muqabala was a massive success at the box office, winning four National Film Awards, making this set of old lobby cards highly collectible! Printed and circulated after the original first release of the film (somewhere in the late 1990s), this set comprising 6 still photos was made for publicity of the film and was actually used inside a theater that screened the film! The four corners of each of the 6 photo stills feature punched holes and display tell tale sings of being pinned on the notice board of a movie theater. 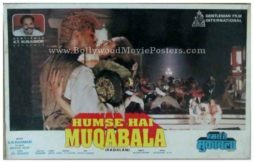 Printed on glossy thick photo paper, this set of old lobby cards was designed and printed for publicity of Humse Hai Muqabala inside a cinema hall.